Not content with doing the Black Templars, Robert is now tackling the Mentors. 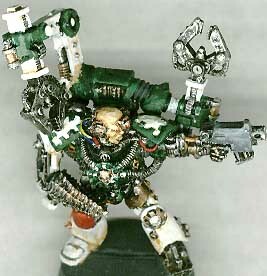 This marine is equipped with an old ork bolter to represent a typical prototype the Mentors are known for. Robert did the conversion. I wanted to try shading white, so I have done the final pass on this guy with a dark brown wash over the white bits, plus grey, yellow, brown and metallic details. The bird head decal is off the Chimera sheet, and is perfect for the Mentors. Robert wanted an unusual model for his leader- with experimental weapons to go along with the Mentor's background. 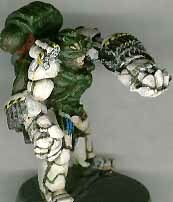 This is a Necromundan Orrus spyrer model with a marine backpack added. Robert painted this one, including the fine caution stripes. 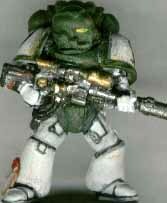 Normally restricted to scouts, the Mentors' penchant for odd weapons led to this sniper marine conversion. This is actually a scout sniper torso, with shoulder pads, legs, head and backpack added from a plastic marine. Techmarines are known for their experimentation, so a Mentors Techmarine must be pretty out there! This conversion includes a repositioned servo arm, an additional servo arm (from a servitor), a rock drill arm from a pit slave, and a bionic leg conversion made by replacing the left foot with a landing gear pad from the epic Thunderhawk miniature! 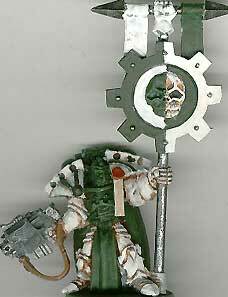 All this on top of the nice Command squad Techmarine model, and well painted too. Kudos entirely to Robert for this outrageous mini.